The Bosch Custom Case System works with the Impact Tough™ Nutsetter clip, providing the best case for the best accessories. 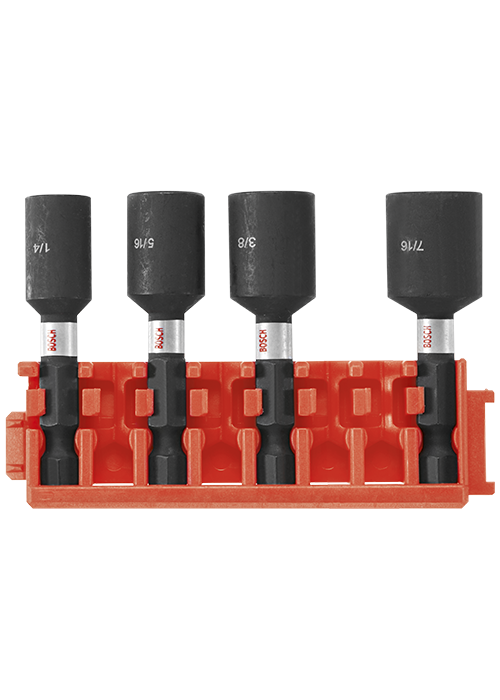 Impact Tough™ Bits have been upgraded to deliver 10X life over standard impact bits. They have an Xtended Torsion Zone to absorb torque peaks to reduce stress at the nutsetter head, which is important for today's high-torque impact drivers. The clips snap in/snap out of the case easily for easy access to carry only the bits needed. The clips come loaded with four nutsetters and provide easy removal of the nutsetters with tilt-in/tilt-out convenience. This customizable organization system features a durable, well-designed case to help users increase productivity by reducing time searching for the right bit. Includes 1-7/8 In. Nutsetters: (1) 1/4", (1) 5/16", (1) 3/8", (1) 7/16"